Thanks for reminding me about Place Pigalle. Part of its charm is that it is so tucked away, but for the same reason, I tend to forget it exists. I'm with Tighe about Lowell's. It has such a great location and history. Too bad the food offers no pleasure. One problem with eating at the Market in the winter is the number of takeout places, but no good (warm, dry) places to sit and enjoy your haul. Afrikando, Mike's Chili, De Laurenti's, Michou (great sandwiches, and they've added soups and salads) have been in rotation for quick food. Also had fish and chips at the fish stand across from 3 Sisters---Good fish, soggy chips. What else? 94 Stewart doesn't seem to get a lot of attention, but it is charming and what I've had of the wine and menu has been good. Does your definition of Market include the hillclimb? In any case, I will be following your postings with great interest. I hope you remind me of the forgotten spots and find some new treasures on the way. And is the pierogi place included? Same with the Athenian. But if you guys could find anything edible there, it would be a good thing. It's such a great space and one of the few true old school Seattle places left downtown. I had the warm beet salad and the mussels. The salad consisted of a pile of warm, shredded beets and some sliced shallots, over a few pieces of arugula, with a walnut encrusted ball of goat cheese on the side. The plate was drizzled with a dijon vinaigrette that was a bit too sweet for my taste and I prefer composed salads with each ingredient tossed (not the cheese, of course) with some of the vinagrette, but that's a minor quibble. It was nice and quite hearty for a salad. The mussels were steamed and covered with a sauce that had diced bacon and balsamic vinegar in it. The mussels were plump and cooked perfectly and, as Abra mentioned, a really nice presentation. It was also a very large portion. Although I normally prefer my mussels in more of a broth than a sauce, the bacony sauce was quite tasty sopped up with the good rolls that were on the table. Rocky's onion soup was so good that I plan to go back and have a bowl of it soon! I also had the cassoulet. It was $18, which is definitely an expensive lunch, but it had so much meat in it that it's hard to quibble. There was a whole rabbit thigh, at least 6 dollar sized pieces of beef cheeks, a 3" piece of sausage and then perfectly cooked flagolet beans. Paul was able to have the leftovers for lunch. Rocky's french onion soup was my favorite thing though. I'm looking forward to having that again. That's a great one for winter - a nice bowl of borscht and a plateful of pierogi. The tiny seating area is cold though. OF COURSE they have to go to Lowell's and the Athenian! Of the two, IMHO the most 'wretched' (as Tighe would put it) food came from the Athenian. Actually I don't feel like anything I've had at either place was wretched, but, um, disappointing, and really sorta BAD, yes. And you know what? I still love that place. It has such a great vibe. Yep, the horseradish addition made the Reuben come alive with flavor. Very tasty! I also enjoy The Other Coast's Reuben, since I'm a Jack Sprat kinda guy (not big on eating fat) but they do tend to overdo the sauerkraut at times. I'd never been here but you could tell they have lots of regulars! Jan and I got there about noon and they had a pretty steady stream of people until we left. We ate at the counter. 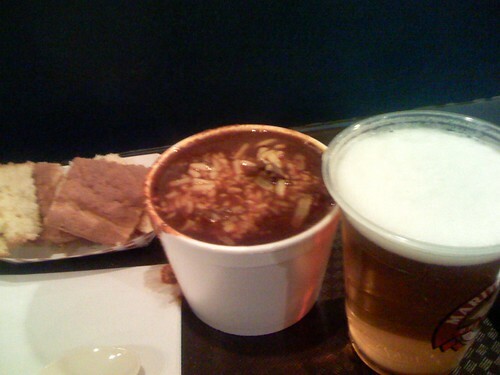 I got a Texas sized bowl of Medium hot Texas chili over black beans with corn bread and a beer. Thank god for the beer because medium was pretty damn hot to me!! I really liked the big pieces of fall apart beef in the chili. the corn bread was good for crumbling into the bowl and thats about it. Jan had the texas chili over mac & cheese- I'll let her post about it. Due to crazy schedules we had to split up this week- Lauren and Rocky went yesterday. 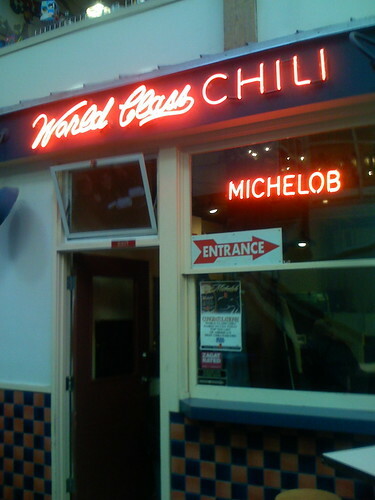 I liked the chili here and would go back, next time I might get my chili over pasta shells! Rocky and I were joined by Tighe for our lunch yesterday. And, what do you know, we ran into hhlodesign on our way out of the Market! It's a small, small foodie world. 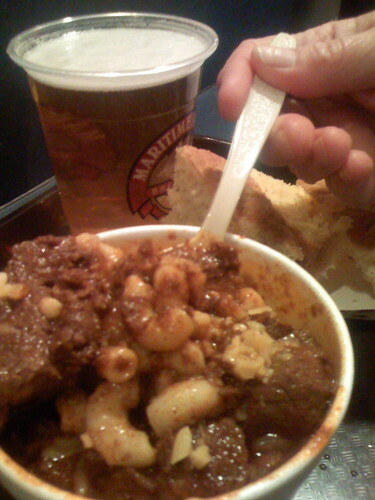 While I liked the Texas chili itself (especially the beef chunks), I felt that the mac and cheese pretty much ruined it. Not only was the mac and cheese dry, it also added an unpleasant flavor and intense saltiness (even for a salt lover like me) to the otherwise tasty chili. I enjoyed LMF's chili over black beans. I'd like to try it over pinto beans. The server didn't ask me what spice level, so I assume mine was mild and yet it still had a nice bite to it. I like that they don't charge extra for options like grated cheese and onion, but rather have out a little condiment tray with the cheese, chopped onions and some sliced jalapeno's. The place was quite busy with a line out the door the whole time we were there. It must be chili weather! 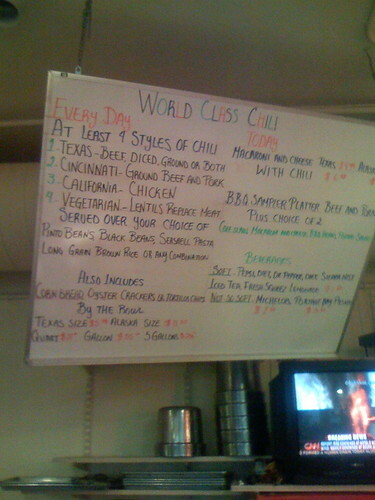 They also had Cincinnati chile, made with pork and beef. I guess one of us should have tried that--maybe next time.